URLs are great… but people that use the default URL wordpress spits out, or try to stuff their URLs lose human value, and thus some SEO value too. Google likes short URLs – Matt Cutts of Google once said “Now, our algorithms typically will just weight those words less and just not give you as much credit. Hey, how’s it going, this is Tim Brown, and this is another episode of “Google Likes It.” Today we’re going to talk about how Google likes it when you keep your URLs short. By default, a lot of website systems like WordPress and other ones will actually make your URL (the link) as long as the title. You don’t want it to be that long, so we can actually condense it down. How does this look to a regular user? How would it be used on social media? How would people interact with this? Thank you for joining me for another episode of “Google Likes It.” Join me again next week. Your website should load quickly. It’s a better experience for people coming to your site, since most people are somewhat impatient, and if another site can give them the same information quicker – than why not just go to sites that don’t take a long time to load? Why does site speed matter, and what’s an acceptable speed? Beyond just people having a good experience, Google uses site speed as an indicator of what it will serve up to searchers. That’s why it’s one of the biggest pieces of technical SEO that you can master. To Google – everything is just headed in the direction of serving it’s searchers (and selling Adwords advertising), so when their algorithm can ‘see’ people bouncing back to search results after landing on your page for 4 seconds (because your page took too long to load) it will use that as a signal that the person didn’t really like what they were served. Google likes it when your website loads in less than 2 seconds. It likes it because it is more likely to keep using it’s platform longer if it doesn’t serve people frustrating websites! How do you figure out what your website speed currently is, and what issues to fix? Go to the root folder of your website with FTP. Hey, how’s it going? It’s Tim Brown, and this is the fourth episode of “Google Likes It.” We’re going to talk about how Google likes it when your website loads in less than two seconds. Two seconds! Yes, because it’s a great user experience. Google likes giving people that are on Google a great user experience. It uses that as one metric to figure out if your website is going to be a good experience for the people searching on it. It knows, and I’m always humanizing Google, but the algorithm can decipher whether you are giving people a good experience. If not, they click back to search results. Use pingdom to test. You can go to HookAgency.com/pingdom to check out this tool. Look at the suggestions that it gives you and do them. 1) Use Smush.it to get images under 100kb -Ideally, they’re 30 or less, but you can use backgrounds up to 50, and your very important images up to 100 at most. 2) Use WordPress Fastest Cache – This one is very specific to WordPress, but WordPress Fastest Cache plugin is one the quickest and easiest to setup caching plugins. 3) Use Gzip in htaccess for compression – I’m going to leave this in this post. If you go to GoogleLikesIt.com, you can see the code I’m suggesting you put in your htaccess file and a little excerpt about how to do that. An ‘alt tag’ is another little element in the code of a website (and a field you can easily fill out when you add an image in WordPress), that tells a search engine what the image is. It also can be used to describe any particular image to someone who is blind and browsing the internet with a screen reader. For the purposes of SEO – there are certain things you can do to make an image more likely to earn you traffic from search results on Google. Google likes it when you use keywords in your image alt tags. This was one of the first things I learned regarding SEO about 6 years ago – and it was using this technique that I used to start getting some traction for visual focused content before I even learned about the broader concepts of SEO. Simply – it works. Google image search is very popular, and if you offer service for anything that people make decisions on visually (which is almost everything) you can use alt tags to further rank your pages and articles. You want to actually describe the image and what’s in it. But you also want to use keywords and the topics of the article and page as much as possible. You can also name-images-like-this-with-keywords-and-description.jpg for even more visibility. Google can read all of this information, including the file name – and uses it to figure out what the image is about. SEO is sometimes about how all of the little things add up to give you a competitive advantage, if you can create a habit of always describing and image and using keywords in the alt tags of your images – you’ll have another (very substantial) advantage in getting more traffic. Every little bit of an edge you can give your website in search results matters. If your competitor doesn’t fill out their alt tags, or using file naming conventions to get more Google traffic from image search (and beyond,) than there is opportunity for you to use this technique to make your pages and posts more attractive to Google on a regular basis. As always, the best way to wield this SEO strategy is to build it into your process, or if you’re part of an organization – to make it part of the system, and required on every post and page created. Google likes it when you don’t feed it pages that have very little (or duplicate) content. Now the most common ways people with WordPress get duplicate content – is tags, category and author pages. Using the Yoast SEO Plugin, you can make sure these are not indexed though. For any posts where you have thin content – you’ll want to de-index those pages. In my case we have a ‘Coolest Designs’ page, which is a listing of cool designs, but the posts themselves have VERY thin content, so we don’t want Google to index those, perceive our site as low value because of the lack of content – and count that against the rest of my site – so we’ll switch the setting over to noindex. Now what about Duplicate Content? By de-indexing categories and removing them from your XML sitemaps – like so, you can reduce the probability Google will find these types of pages redundant. The main reason you’d want to do this is that your content may be getting crawled on those pages. Lastly – and most simply of all, avoid thin content by NOT WRITING SHORT POSTS – or Adding content to posts that are too short, and getting to at least 350 words per blog post. Also – if you have products on your site, you want to try to hit at least 350 words in the product descriptions. Hey, how’s it going? This is the second episode of “Google Likes It.” We’re going to talk today about how Google likes it when you de-index thin and duplicate content. This is a very big piece of SEO, which is, you can’t have all this thin content on your website. 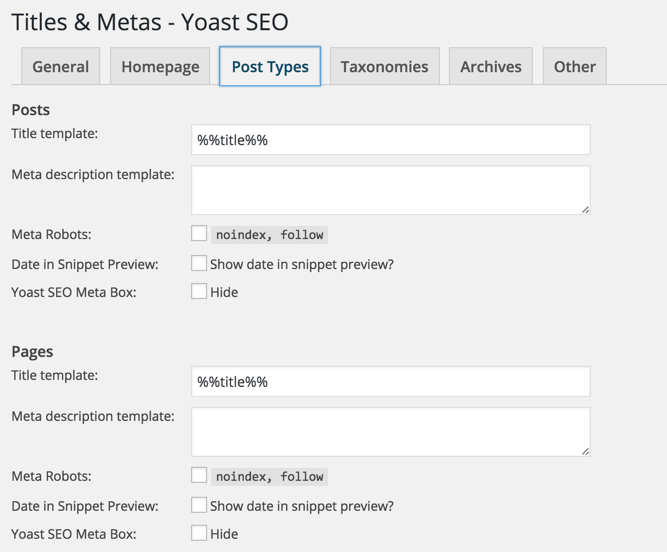 2) ‘No index’ in Yoast – If you’re on WordPress you can install Yoast SEO, turn on advanced settings, and go to ‘title and metas’ and ‘no index and ‘no follow’ the types of posts that aren’t appropriate for Google to crawl. So let’s say testimonials, if you have a testimonials page with all those testimonials on it, perhaps you want to de-index the posts themselves because they’re very thin. You want to look at those and think to yourself, do these need to be indexed individually, maybe not. 3) Remove from sitemap – Go to the XML sitemaps function, and you say “not in sitemap” for post types and taxonomies that aren’t necessary to have in your sitemap. Perhaps the categories are not important for your site to have in the sitemap, because you have of that listed on the main blog page. SSL Certificates used to be for E-commerce sites, and sites that handled sensitive information only. But as of recently, Google has started giving preferential treatment to HTTPS / SSL protected sites across the board. Some might say it’s because Google is a megalomaniacal tyrant that drives webmasters with its ideological whip. Other’s might guess that Google is flagging unsecured sites now – because they want both website visitors to feel comfortable, and they believe any site that allows you to input any kind of data – should keep that data safe. And safe – means encryption – WTF is encryption? SSL is like your electronic – internet passport! SSL stands for Secure Sockets Layer and it’s the standard security technology creating an encrypted link between the server and a browser. With the power of an SSL certificate, the information becomes unreadable to anybody trying to read it except for the server you are sending the info to. How does SSL effect SEO? If Google (and it’s Chrome Browser) are slowly giving more and more visual clues to protected sites and unprotected sites – they are essentially nudging users into paying less attention to the unprotected ones. Google is incentivizing people to ‘Prove it’ that they are who they say they are. We know that SSL certificates and HTTPS encryption is good for users – because they are more likely to do business with a company that protects their information, and gives evidence to that security on their site. Recent studies conducted by Brian Dean, SEMRush and Ahrefs a solid connection between HTTPS and higher search rankings was found, but other’s such as Moz – have contested that it’s more of a ‘Tie Breaker’ than a major contender for something that defines who’s the big winner and big losers in search engine results pages. If there are 5 tie-breakers that all give you a slight advantage and you roll all 5 out, then who has the advantage?! You! Yes, each of these on its own is not enough to make your site dominate your competition, but overall – it’s OK to focus on them when in conjunction, slight advantages turn into major one’s overtime. It doesn’t have to be extremely logical (you may not have forms that require encryption) for it to help your site in organic rankings. Just make sure to do it in the most efficient way, and make sure all your sites files are linked to the HTTPS version after you roll out your SSL. In our next ‘Technical SEO Simplified’ post, we’ll give you a checklist for making sure you roll out SSL in the most efficient and SEO friendly way possible. So Gypsy is going to join us for the first episode of “Google Likes It.” In this episode, we’re going to talk about SSL certificates. First thing I want to talk about is why Google cares if you have an SSL certificate. 1) Security – The first reason, and the original reason for an SSL certificate, is so there’s encryption. That means there’s a secure connection between the server and your browser so that the information is not passed off to other entities in the process of getting entered into your site. Anybody with e-commerce or passing sensitive medical information was supposed to have an SSL certificate. Now, anyone that has a contact form could have one, and indeed it’s good for SEO. So anyone should have one. 2) Identification – It essentially proves it that you are who you say you are to Google. That’s another reason they’ve been honoring sites with an SSL certificate over other sites. 3) SEO Tiebreaker – If everything else was the same, if the content was the same, if the links to your site were the same, Google would use it as a tiebreaker between you and another site.